Most unusually it was a quiet week at work and for a couple of days I’d been feeling a little under the weather, so the prospect of a mid-week SOTA activation that would get me out of the office and into the fresh air of the Great Outdoors was very appealing. I noted alerts by Rod VK2TWR for three Summits that he planned to activate, and another by Ross VK2BJP. Hmm, I thought, now which Summit(s) can I get to for an easy Wednesday expedition? Some time ago my lady and I had explored the Eskdale Spur Track and had noted two Summits, Lockhart VK3/VE-135 and an unnamed Summit VK3/VE-144 that required a bit of bush-bashing to access, though we didn’t climb up and activate them on that trip. We did, however, go on and activate Wild Horse Hill Range, VK3/VE-130. I remembered that as being a fairly easy trip and so I thought I’d head back up there, but this time I’d scramble up through the bush and activate those first two Summits. I duly posted alerts for all three, coordinating my times with Rod and Ross to maximise the chances of making Summit-to-Summit contacts with them both. The weather couldn’t have been more perfect for SOTA work; bright sunshine and forecast temperature around 20 degrees. The early morning fog that fills the river valleys at this time of year had lifted by the time I left Albury and made my way down to join the Eskdale Spur Track at Lockharts Gap. I was on schedule as I arrived at my intended parking spot for the walk up to Lockhart. The map shows a trail branching off the Eskdale Spur Track and going direct to the Summit, but in fact there is so much regrowth there that this trail has all but disappeared. I crashed about in the bushes for a while but couldn’t find it, so eventually followed a wombat trail that went in more or less the right direction. This proved to be a good choice and I arrived on the Summit in good time, allowing me to get set up and have a drink before getting on the air exactly as scheduled at 10.01am or 0001 UTC. As expected for a work day I found 7MHz quiet, but I put up a spot on SOTA Watch and over a 25 minute period I worked VK2DAG/M, VK2JDS, VK2KJJ, VK3FQSO, VK3ERW, VK3PF/M, VK3CAT, VK3ASC, VK3AMB, VK3DET and VK2KTT. I was a little early for both Rod and Ross, neither of whom had reached their first Summit of the day. I was most intrigued to work Erwin VK3ERW, whose signal had a very odd audio distortion on it. It sounded like packet loss on a data link, but how could that be on an analog SSB signal? All was revealed when Erwin explained that he was remotely controlling his station via an internet link. I had forgotten to bring my camera with me on this expedition. No worries, I thought, I’ll just snap a few with the iPhone. But it was not to be; the iPhone was having another of its conniptions and refused to cooperate. It’s near the end of its service life, and it very nearly ended it permanently there on the Summit! So unfortunately there are no pics of this expedition to liven up this entry. I didn’t hang about on the Summit but quickly packed up and headed back down to the ute. Going downhill I made better time, and on the way down I found the line of the old trail shown on the map. There’s not much left of it now, and you can only tell it was once a trail because under the regrowth it’s level and devoid of boulders. I followed it for a short way until the regrowth became too dense and I had to strike out along another of Mr Wombat’s handy paths. Back at the ute, it was about a 5km drive along the Eskdale Spur Track to my chosen parking spot for VK3/VE-144. This Summit is a lot closer to the track than the previous one, and required just a short stroll up through fairly open bush. Once again Mr Wombat provided a trail that got me almost to the top, and I was on the air within ten minutes of arrival. I noted a bit of activity on 7MHz so clearly the activations had stirred up a bit of interest from activators and chasers alike. In a quick half-hour activation I worked VK3FQSO, VK2TWR/P (S2S), VK2IO/P (S2S), VK3WRL/P (S2S), VK2BJP/3 (S2S), VK3ERW, VK2YW, VK3PF/M, VK3CAT, VK3EK, VK3AFW, VK3ASC and VK3ANL. A brief foray on 14MHz caught Nev, VK5WG to complete this activation. 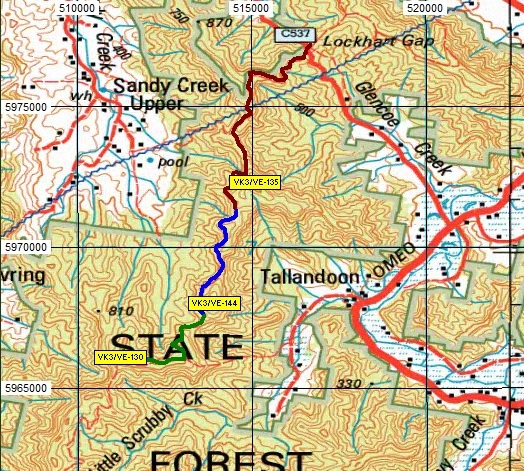 It’s about another 5km further along the Eskdale Spur Track to Wild Horse Hill, where Steele’s Track goes off towards the Mitta Mitta valley. From the intersection it’s about 1.5km to the Summit. The trail passes close to the Summit and it’s an easy stroll through open bush to the top. I set up on arrival but decided to have lunch before calling CQ. I left the radio monitoring 7.090 while I munched my sandwiches and had a cup of tea, enjoying the warm sunshine and the gentle breeze. In keeping with the relaxed atmosphere at the Summit, I took my time over this activation. In just over an hour’s operation I worked VK3ERW, VK2HRX, VK2YW, VK3BHR, VK3FQSO, VK2TWR/P (S2S), VK3CAT, VK3PF, VK3ANL, VK3ASC, VK3DET, VK3HAK, VK2IO/M and on 14MHz Vk5WG. So there it was: three successful activations on a mid-week expedition, including a surprising number of Summit to Summit contacts. The evidence shows that the SOTA programme is gaining in popularity and bringing with it a lot more activity to the bands. Don’t assume that just because it’s Wednesday there won’t be anyone on the air. Put up an alert on SOTA Watch, spot when you are on the air, and you’ll make plenty of contacts.